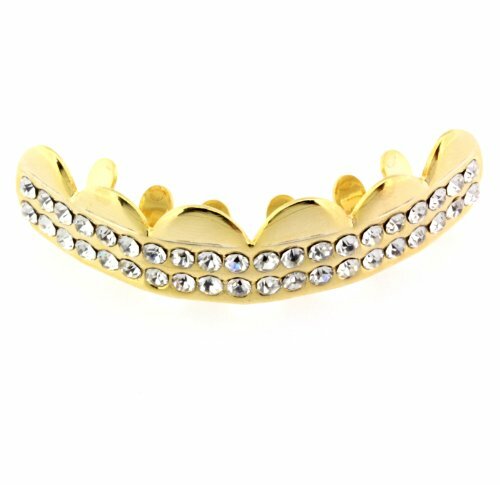 Our Grillz are Gold Plated with two rows clear rhinestones. They are One Size Fits All and can mold to any mouth size and shape. All of our Grillz sets include reusable silicone molding bars to custom fit the Grillz to your mouth. Our sets also include easy instructions to fit your Grillz within minutes. This set includes only the top row Grillz. View More In Dental Grills. If you have any questions about this product by L & L Nation, contact us by completing and submitting the form below. If you are looking for a specif part number, please include it with your message. Hip Hop Gun Metal Hematite Teeth Grillz Set "Baller Ice"